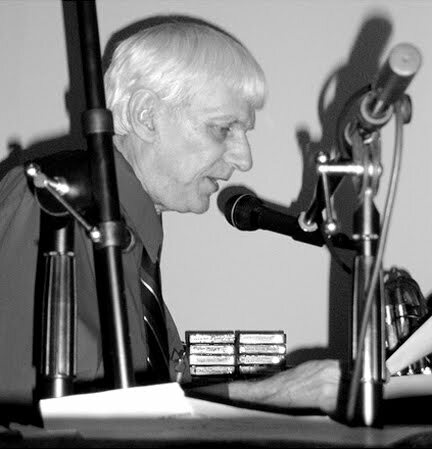 31 years and counting, that’s how long Don Joyce of Negativland has been been hosting the late night sonic universe that is Over the Edge on KPFA in Berkeley. In these days of rapid technological and cultural transformation, it is reassuring that there are pioneers willing to devote over three decades to navigating the bleeding edge of a rarefied art form, in this case: the radical free-form radio mix collage. It all started in 1981 when Mark Hasler, founding member of the renown experimental electronic ensemble Negativland (infamous for their illegal appropriation of a U2 album cover), met Joyce, who was doing a more mainstream style radio show, and suggested to the radio producer that the radio booth could be less like a medium for playing records and more like an electronic music studio. Why not exploit all that equipment and push the envelope? So Over the Edge was born. So Joyce’s radio broadcast became a medium for live performance and real-time collage, in which sounds, guests, and esoteric commentary all coalesced into a wild sonic dance. The rule is, if you call in, don’t say hello, just keep the show moving, fluidly, a non-stop manic layering of audio, appropriated music, spoken word, noises, and anything and everything. The three hour show is still going strong at 12:00 am PST and you can pick up the broadcast via the Internet anywhere in the world. If you tune in at the witching hour and you hear Vangelis’ Heaven and Hell being pulverized by an effects processor, you know you’re in the right place.